“Motorcycle Classics Magazine” and our good friend Richard Backus. Often at the race track Richard is a world of motorcycle knowledge and never fails to come and see us and encourage us on. We will add lap videos of our the various tracks we race – enjoy, and if it helps you to get around the track better then great! Here are 2 other links which are very important to me about racing. Of the whole site, this is perhaps my favorite, and the page to which I direct people when I give them my card with the website. Please take a few minutes to view these videos – you won’t regret it! 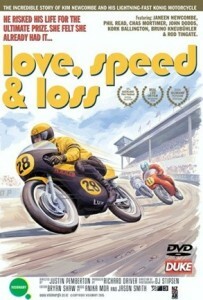 This is a documentary about racer Kim Newcomb and his wife. This video gives you a strong insight to what is still nowadays our attitude towards racing, the paddock, and the ups and downs of our weekends at the track. This is the documentary “Continental Circus”. The epic battle between factory rider Giacomo Agostini and privateer rider Jack Finlay. Great camera work, you are again torn apart by the human side of motorcycle racing.